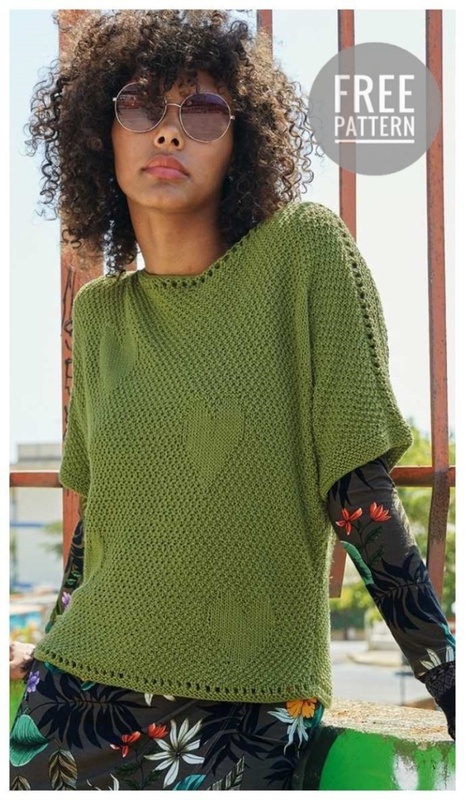 Fitted style, using natural yarn and beautiful, but incompatible pattern make this jumper a great choice for a warm season. Yarn (100% cotton; 130 m / 50 g) - 350 (400) 450 g green; Circular needles №4,5. Face and inside rows - face loops. An odd number of loops: individuals. rows: close out, * 2 points, knit together the person, 1 sue, from * repeat, end 1 person. and chrome. Out rows: loops and nakida crammed with the inside. rows - front loops, back side rows - back side loops. 1st order: krom., Knit alternately 1 w., 1 person, finish 1 w. and rom. 2nd and 4th order: knotting the loop by drawing. 3rd row: chrome., Knit inversely 1 person., 1 out., Finish 1 person. and besides. In height, repeat from the 1st to the 4th row. 20.5 p. X 30 p. = 10 x 10 cm, related to the main pattern (spokes №4,5). Because of the large amount of lashing, the stitches are knitted in rows in the back and forth directions more conveniently on the circular needles. Ha spokes №4,5 dial 101 (109) 117 p., And knit for planĸi, starting PHI c. number, 2 cm = 5 p. patch viscous + 2 p. Artificial track. Through 4.5 cm = 14 p. From the plan, add for side bridges, as shown in the diagram, first 1 time for 1 p., then 3 more times in each 8th p., 3 times in each 6th p., 3 times in each 4th p. . and 11 times in every 2nd p. on item 1, to include loops in the basic pattern. In 46.5 cm = 140 p. (48.5 cm = 146 p.) 50.5 cm = 152 p. from the side to close on both sides, for the top of the arms / shoulder bevels, start 1 time 6 (7) 7 points, then in each 2nd p. 7 times for 7 points (5 times for 7 points and 2 times for 8 points) 1 time for 7 points and 6 times for 8 points. Simultaneously in 48 cm = 144 p. (50 cm = 150 p.) 52 cm = 156 p. From the strap, close the neck for the average 25 sts and both sides to finish apart. To curb the neck, cover from the outside edge in each of the 2nd p. 1 times 4 points and 4 times 2 points. After 52 cm = 156 p. (54 cm = 162 p.) 56 cm = 168 p. from the strap close the remaining 7 (8) 8 n. shoulder. On the other hand, finish symmetrically first. For the proshva, dial on round knitting needles No. 4.5 on the upper edge of the sleeves / shoulder edge of the backrest in 62 (66) 70 points, on the edge of the neck of the backrest 49 points and all 173 (181) 189 points. The next row (= =). row) to bind out. baptized Then run an open path 1.5 cm wide = 2 p. and more 3 p. knit garter viscous, while in the 2nd p. (= izn. row) openwork knit knit face loops. After this, on the 62 (66) 70 points of the shoulders on both sides, temporarily leave, the middle 49 points on the close = the edge of the neck. Pass through the top edge to perform similarly. Front and back of the left side of the net strap obeyh parts together and hand knit together hand in hand. For the planks, set along the lower edges of the cords in 66 (72) 78 sec. And knit 3 cm with a knit fabric. Then close the loop face.